Sequel to Red Eagle's War. Originally published as Kane's Promise, Red Eagle's Revenge is the second in a series of three and continues the story of Will Green, a young boy whose family was murdered by the Apache, and Jacobi Kane, the man who rescued Will from the Indians. 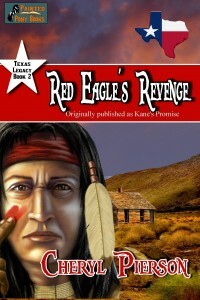 In Red Eagle’s Revenge, Jacobi Kane must lead a band of lawmen in their mission to find and annihilate the remnants of the Apache renegades who were responsible for killing Will Green's parents and Kane's wife and children. But Will knows he belongs at Jacobi Kane's side—not left behind in the safety of the cabin. Once they find the Apaches, all hell breaks loose. Can Kane protect Will and see this battle to a final end?